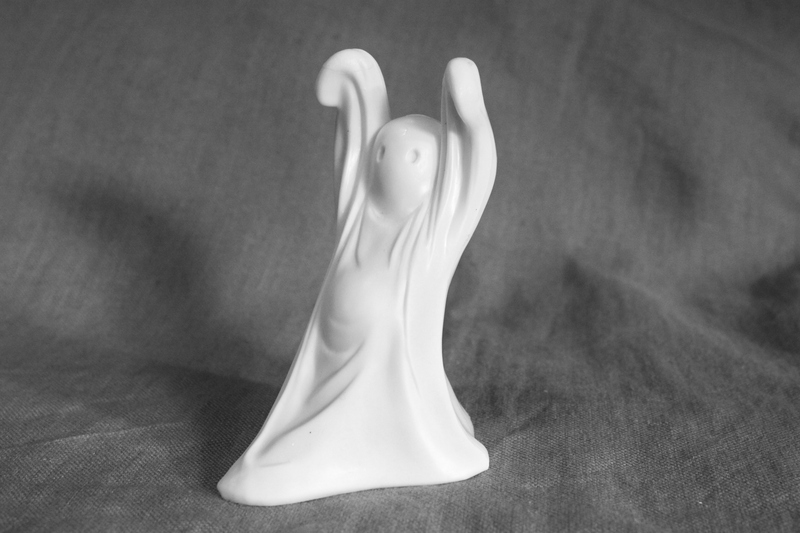 Found this little 5 inch plastic ghost at a junk store not too long ago. I didn’t know anything about him. I just liked his little “pot belly.”………and he was a dollar, my magic price. With a little online investigation, I found out that he’s a Wilton cake topper. Probably from the early 80’s. In 1929 Dewey McKinley Wilton opened a cake decorating/candy making school in a single room of his Chicago, Illinois, home. He shared the skills he had learned working in candy factories since he was about 14 years old. He published his first cake decorating book in 1954, ane even though publishers told him that it would never sell it was a huge success. Because of the minimal words and beautiful photographs, it was a worldwide hit and easy for anyone to learn/copy the techniques regardless of the language they spoke. Consumers loved the book so much that they wanted to buy professional decorating supplies to emulate the same techniques, but there were none available to the general pubic at that time. Wilton filled that need and began a mail order business selling pastry bags, turntables, and paste colors out of the basement of his family home. The Wilton company still gives classes on cake decorating, either in person or online…….and they offer thousands of products, from manuals to cake mixes, to help anyone achieve professional looking results. So he’s a cake topper? Ehhh? That explains the “pot belly”. i love him! this reminds me to look for my shmoo nesting doll at my parent’s house! remember shmoo?? He does look a little like Shmoo….